Some people say that all Eurovision songs are the same. That’s probably not quite true, but there is perhaps a hint of truth in the suggestion that some themes tend to recur from year to year. Hence, I thought, Eurovision Bingo. 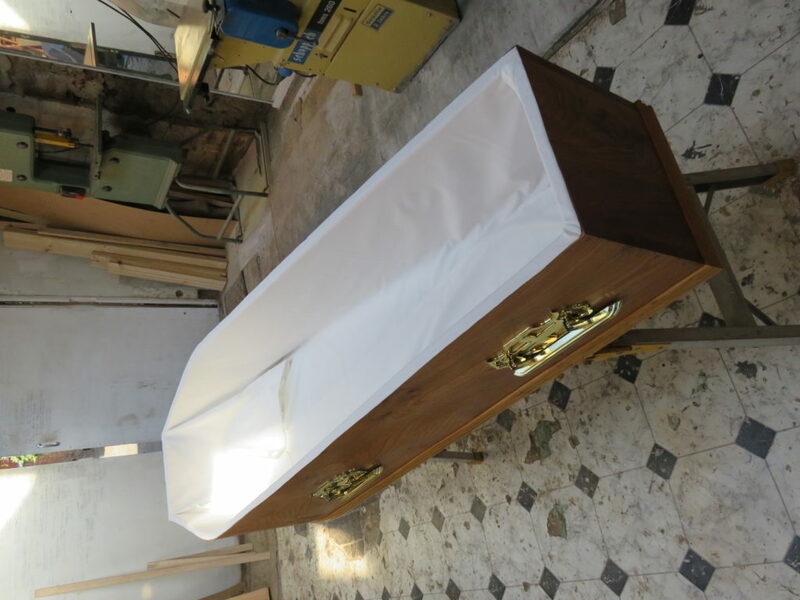 One fairly common need when someone dies is a coffin. There are various sorts on the market, from bamboo eco-coffins to embarrassingly-tasteless photo wraparounds to heavy walnut ones with carved panelling, which seems rather overkill for something which is to be observed once and then buried underground. I was discussing this with my father when he remembered that he actually has several sets of what are called coffin “blanks” stored away in a roof space. 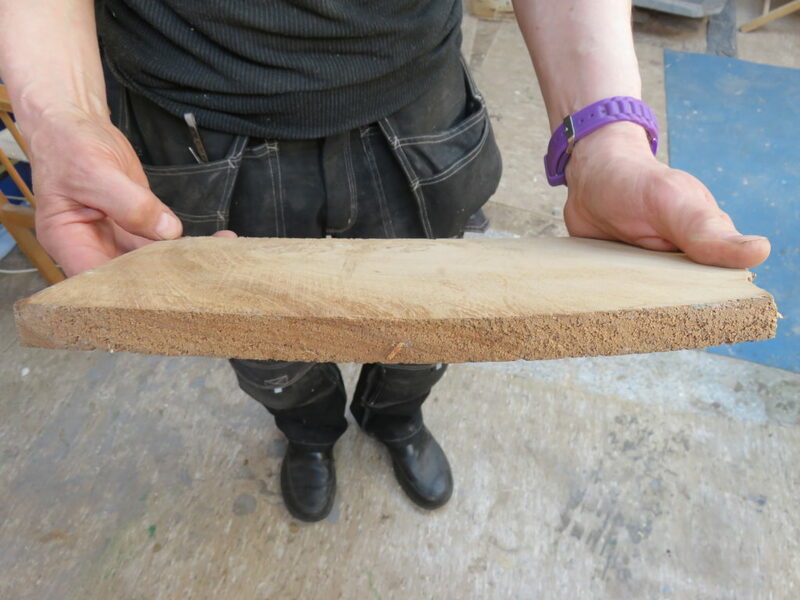 A coffin blank is basically an uncustomised coffin – the top and bottom are full size, waiting to be cut to fit, and the set includes the necessary extra pieces (sides and trim) to make it up. When the local joiner in our home village retired 15+ years ago (and the jobs of joiner and undertaker were the same job for many centuries) he had several sets of blanks spare, and my father obtained these from him and stored them. 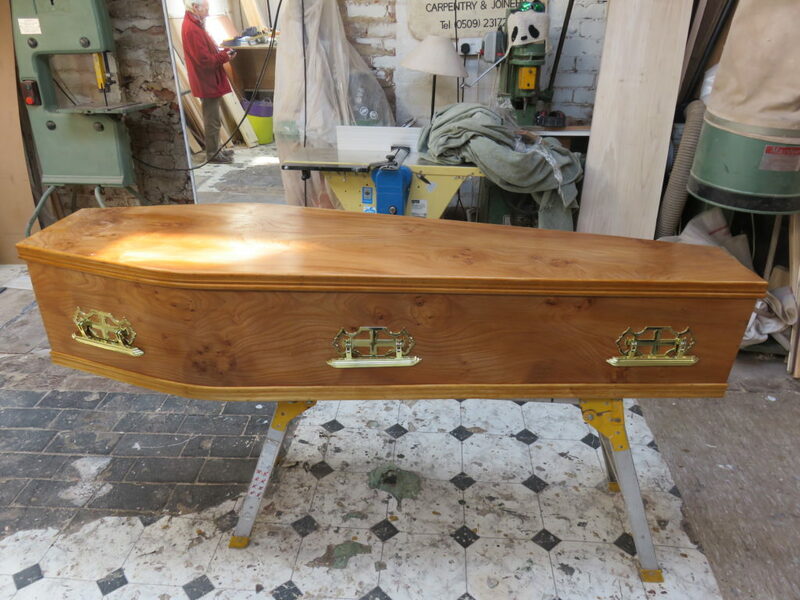 They are made of elm, which is a traditional material for coffins but is now almost never used since Dutch Elm disease devastated the British population of elm trees in the 70s and 80s. We’re very pleased with the results – it’s a lovely job. John’s is on the left, then William’s, then mine. I pencil out the designs on the eggs for them, in William’s case according to his specification, and then they try and follow them with the heated wax pen (called a kistka), with varying levels of dexterity and success. Still, even a shaky hand produces quite beautiful results, I think. One thing which appeals to me about this art is that it produces artifacts which are both beautiful and very fragile – like human beings. Paul writes, using a similar analogy: “But we have this treasure in jars of clay to show that this all-surpassing power is from God and not from us.” The treasure is the gospel, and we are the jars of clay – weak vessels who can do nothing by themselves but can, with God’s help, nevertheless powerfully shine God’s light into the world. And since that memorable victory, every day Christ is overcoming death, for He gives His Spirit to His saints and having that Spirit within them they meet the last enemy without alarm. Often they confront him with songs. Perhaps more frequently they face him with calm countenance and fall asleep with peace. I will not fear you, death, why should I? You look like a dragon, but your sting is gone! Your teeth are broken, oh old lion, why should I fear you? I know you are no more able to destroy me, but you are sent as a messenger to conduct me to the golden gate wherein I shall enter and see my Saviour’s unveiled face forever! When our boys (now nearly 6, nearly 5 and nearly 3) first got old enough that it made sense to pack them each a bag when we went away, we found it hard to find something suitable. 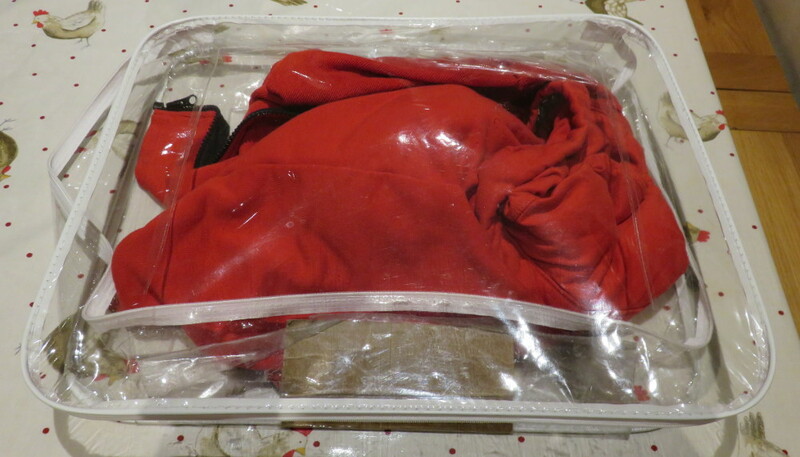 We ended up using some transparent plastic rectangular zippered bags with handles, which had originally held mattress covers when on sale in a shop. These were just the right size, and it turns out that having a transparent suitcase for kids is really rather handy for a number of reasons. However, mattress cover bags were not really designed for reuse and, despite the liberal application of clear Duck tape and cardboard patches, soon they were definitely showing the wear and tear. All their birthdays are in a 40-day period over Feb/March, so we decided we’d get them all transparent suitcases this year. After all, someone must sell those, right? Turns out, not. Most people apparently don’t want strangers peering at their dirty underwear in the airport security queue. Funny, that. So I came up with a hack. 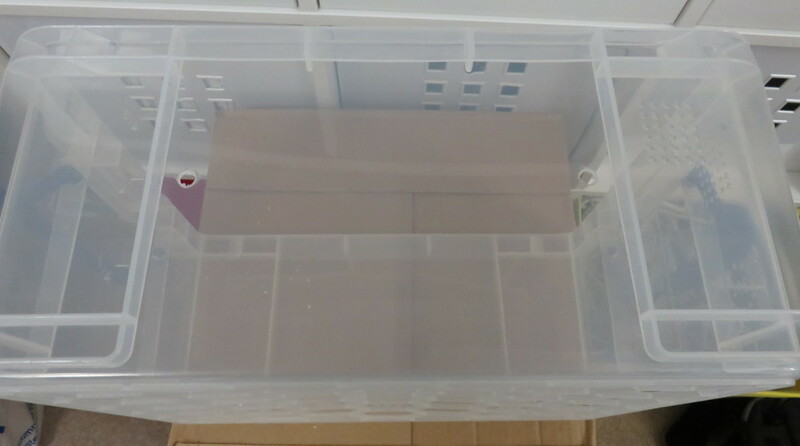 Start with a “Really Useful” box of an appropriate size. (You’re better off with an original; these are much imitated but never bettered.) 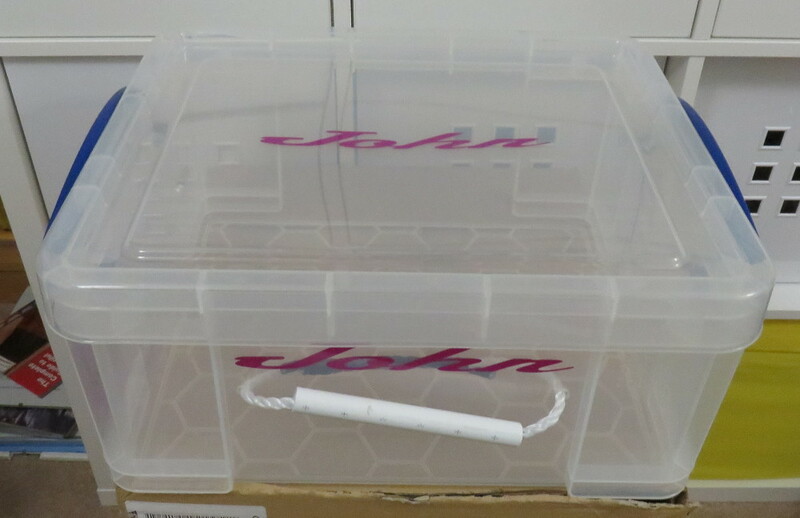 We used their 21 litre box; you may want larger or smaller. 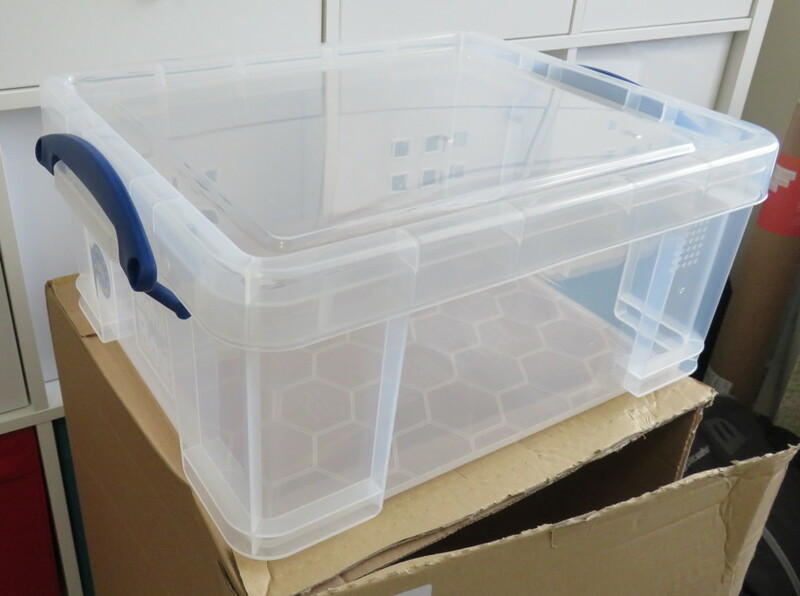 Such a box can be carried by the sides, but not with one hand, and the span is a bit tough for the younger ones. So we need something else. Remove any ugly sticky labels the shop may have attached, and drill a couple of holes half way up one side at the edges of the central section. I find drilling plastic is a slightly uncertain art; if you use too much speed you’ll melt it, and if you press too hard you can crack it, or get stuck swarf. I did get swarf stuck around the holes so they weren’t clean, but mostly cleaned that up with a little light Dremel-ing. 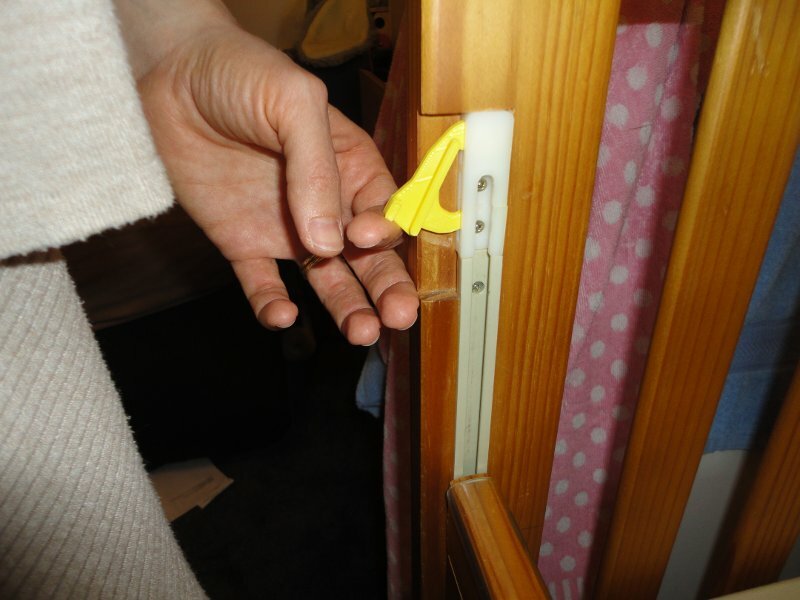 Next, you need some plastic pipe – wide enough that it’s comfortable to hold, but narrow enough that the handles don’t protrude too far or that little hands can’t get around it. I bought this, as being cheap and about the right size. Cut it to a length around 4cm short of the hole-to-hole distance. 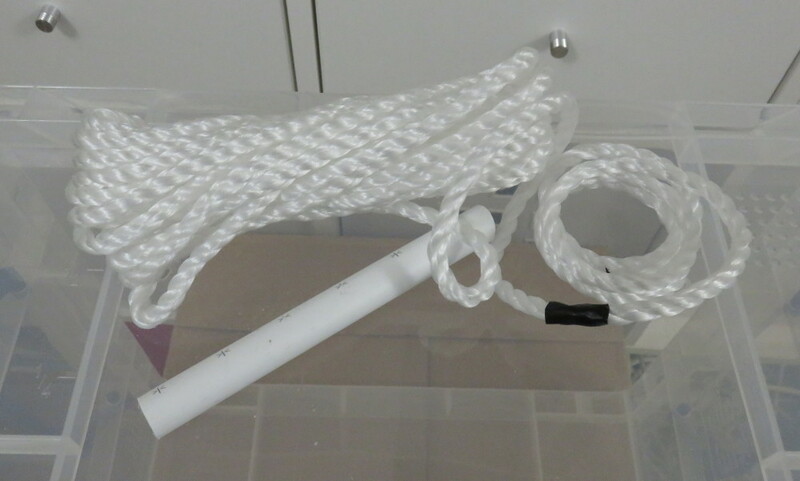 So cut the rope to a generous length (3 times the hole-hole distance), bind round one end and trim, and place through the holes and the pipe. Then, inside, pull the rope tight so each loose end almost reaches the opposite hole, mark the spot, bind round again and cut at the top of the bind. You now have nicely-finished rope and a handle – the only remaining job is to stop it coming out of the holes. Loosening it off some (you need enough play for kids to get their hands under the handle, and if it’s too tight you can’t get the roll of electrician’s tape round behind it) put a small piece of tape to join the two ends at the point half way between the holes. Having this makes it much easier to do the wind-round binding without the rope slipping. 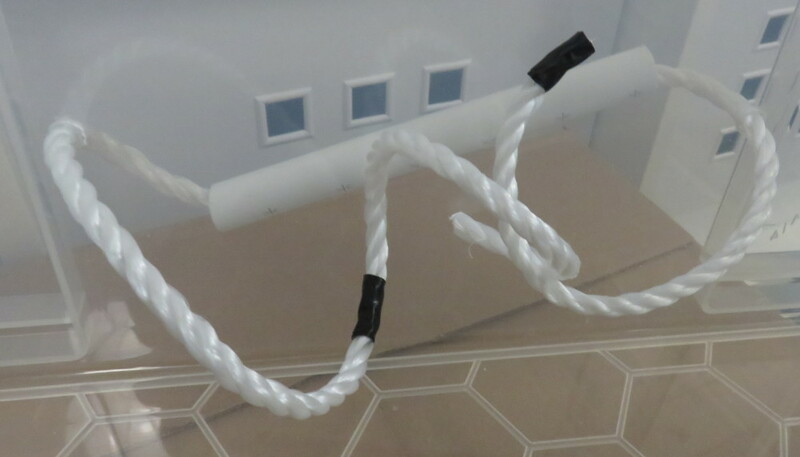 Then, starting at once end with a few turns on top of itself, spiral-wind the electrician’s tape around both pieces, proceeding from one loose end to the other, making sure to pull it tight all the time. 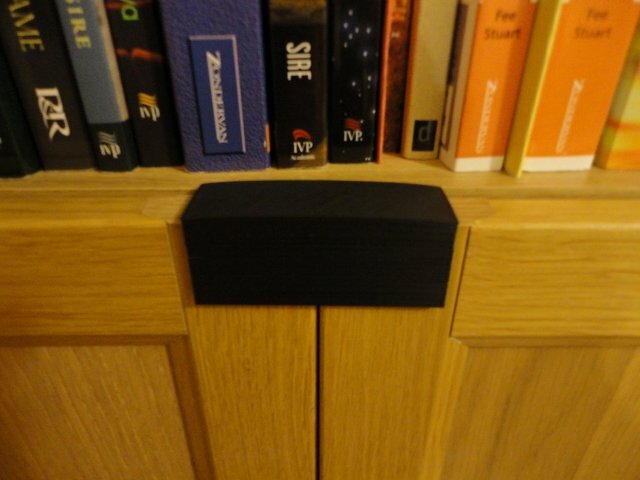 The result is a binding which I hope will support the weight of any sensible thing they are considering putting in there – and, if it turns out not, I can pull the tape off and try something else. 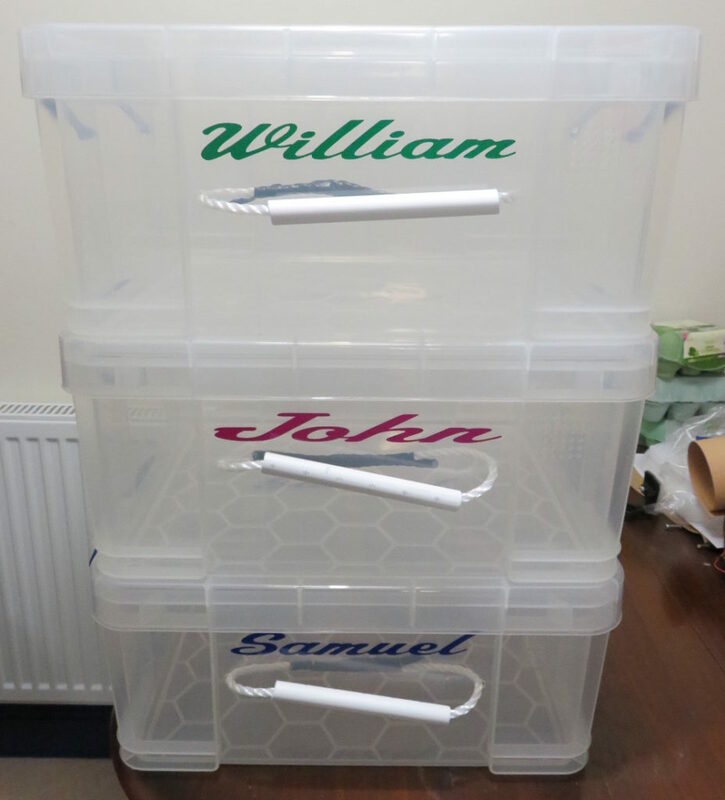 The finishing touch is to personalise them – it was harder than I thought to find name stickers of the right size, as most are too tiny (designed for books or small objects) or too large (designed for walls). But Amazon came to my rescue, and I ordered 3 of these (well actually, I ordered another item from the same company, but that’s what they sent me, and it worked perfectly! ), which come in pairs, and I used their favourite colours. I placed one on the lid and one just above the handle. Being sure to apply the decal from one side to the other rather than from sides to middle (to avoid unsightly creases), I lined them up, stuck them on, rubbed them down hard, removed the backing paper and Bob is your mother’s brother. As well as doubling as under-bed storage when not travelling, and being neat and eye-catching when out and about, these also stack nicely in the car, easing the complex problem I face whenever the whole family has to fit everything they need for a week in our Ford Galaxy. 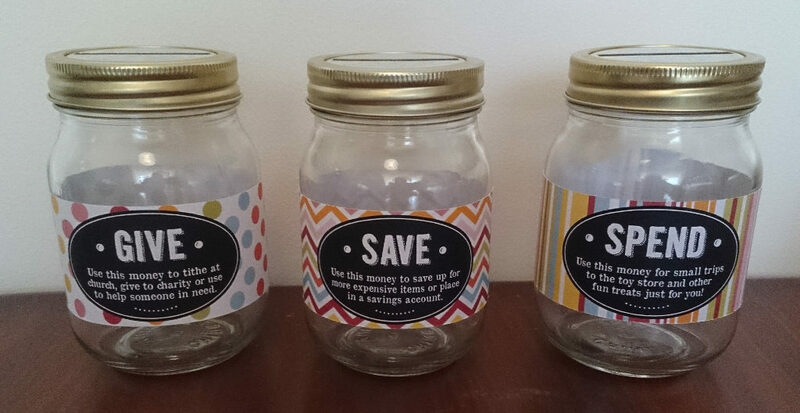 I hope they enjoy using them for many years :-) Cost per suitcase: ~£15. I’m sure you will all recognise the character. 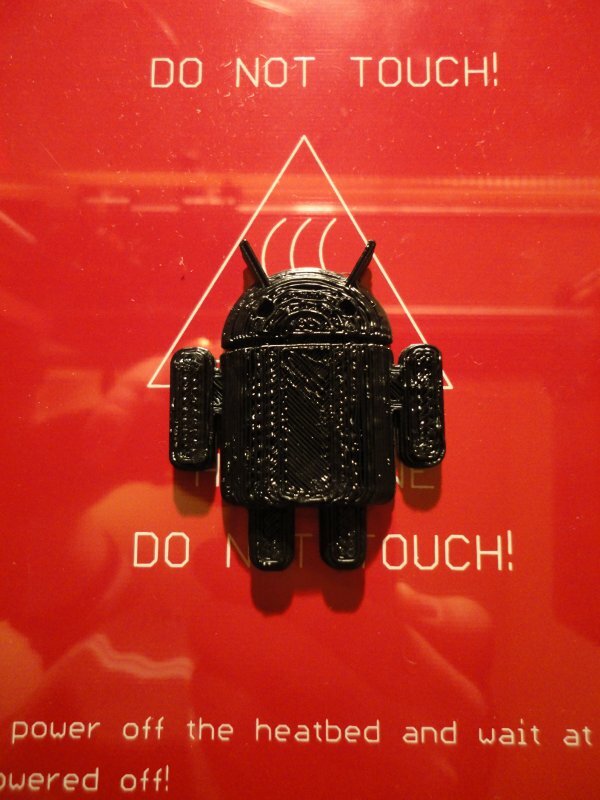 The print quality is pretty good for a first attempt, although nothing like some of the pieces I’ve seen. This was achieved on Sunday evening, 30th September. I started this project on 21st of June, so it’s taken 3 1/3 months. As noted, the printer uses RAMPS electronics. There are a number of compatible firmwares to drive it; I chose Marlin. It’s at this point that the Mendel90 Build Manual starts getting a lot more perfunctory and vague, and I’ve been having to feel my way quite a lot more. I had a couple of days false start when I assumed that the electronics would already be loaded with firmware; it turns out they were, but only a simple testing program, which gave enough response to confuse me but not enough to make any sense! Once I’d asked the vendor and they’d clued me in, I was doing much better. It turns out nop head (the creator of the Mendel90) has his own fork of Marlin, so using that was a start. Fortunately, I’d already stumbled across this GitHub bug warning me I’d need to use a standard baud rate rather than the default non-standard but ultra-fast one. So I tweaked a few parameters and managed to get it to load. (Side note: the Arduino IDE is, frankly, some of the worst software I have come across in many years. If any devs are reading, email me and I’ll provide more constructive feedback.) However, a few things didn’t seem to work right so I ended up porting his changes to the latest Marlin. It’s at this testing stage that I discovered a few problems. 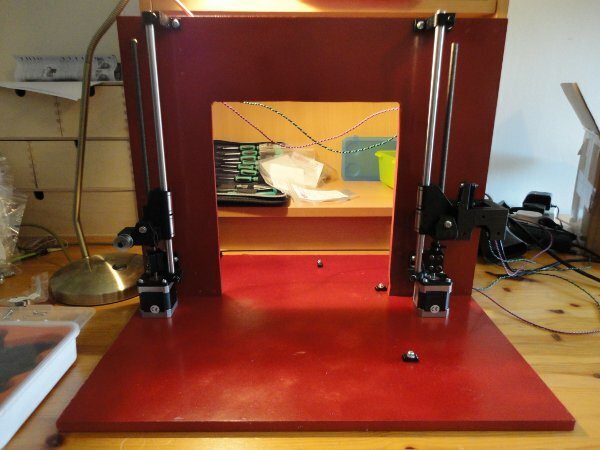 The first was that I had taped my thermistor to my heated bed with aluminium heatproof tape. Unfortunately, the thermistor wires are uninsulated and the shiny side of this tape is conductive. This was causing intermittent shorts. I had to remove the tape, remove the heatshrink around the joints and unsolder the thermistor, and then fully insulate the thermistor wires with heatshrink before taping it back to the bed. Then, I had to correctly set the “0” for the Z axis. This is a number in the firmware, and it took a few tweaks to get right. For a while I had the Z height slightly too high. This meant that the first layer was being printed too close to the glass. This, in turn, meant that there was too much back pressure in the extruder, and the hobbed bolt was tearing into the filament and stopping the drive. 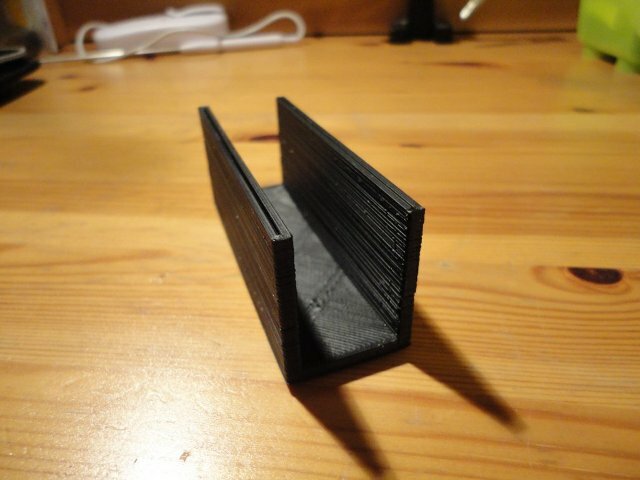 So I got a too-thin first layer, and nothing for the further layers! Once all of that was sorted out, I managed to get multiple layers, but they were all randomly offset from each other in the X direction! Messy. 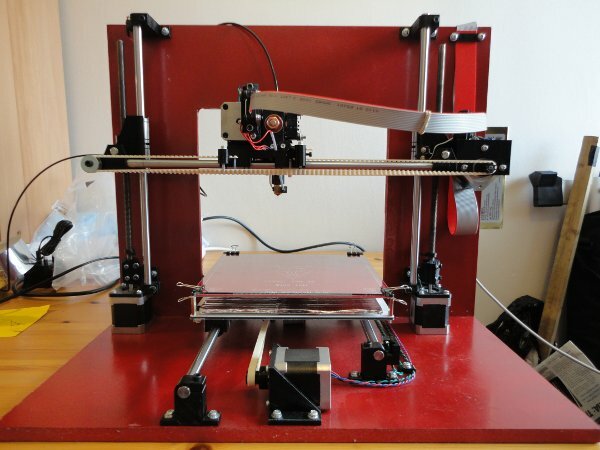 A FAQ on reprap.org saved me here; the max acceleration values for the X and Y axes were set too high. Halving those fixed that. 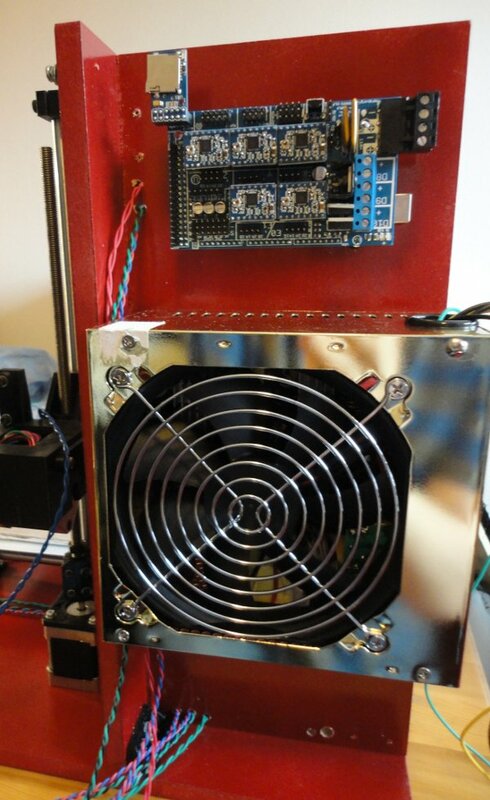 The X/extruder cable runs from the extruder connector across the foreground, via the X motor, then down and back up vertically (to deal with Z axis movement) before going over the top to connect to the electronics. The Y cable can be seen on the base emerging from under the Y carriage, terminating at a cable clamp and being transformed into pairs of heater and thermistor wires. The extruder heater wires had to be extended as I cut the ribbon cable a little short. The loose black wire is a guard loop to reduce interference in the ribbon cable; it needs connecting to ground when I can work out somewhere better to connect it than screwing it into the power connector. I had a bit of a hiccup when I realised that the Molex connectors I had bought to connect the wires to the pins were fine for a single row of isolated pins, but when pins are in groups, they don’t fit because they are 2 or 3 pins wide. Fortunately, a bit of cunning wiring, the removal of some extraneous pins and the filing down of some of the connectors made it so I could squeeze everything in. 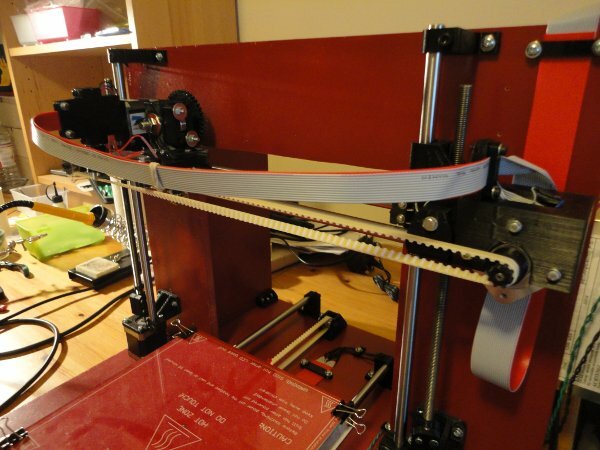 Every RepRap needs power and control. 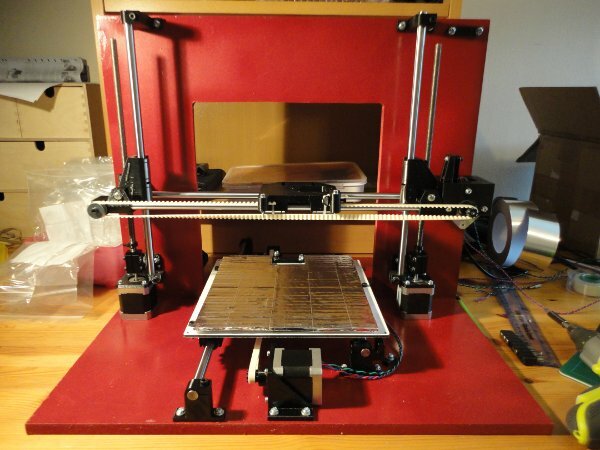 There are various electronics packages available for running a RepRap, designed by different people and optimized for different things. The electronics package I have is a RAMPS v1.4, bought ready-built off eBay from China. 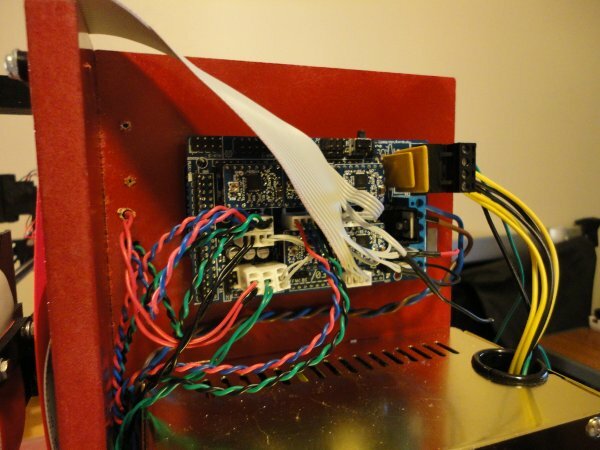 (In order to finish this project in 2012, I decided not to solder it myself from scratch…) Amazingly, it arrived before several parts sourced at the same time from the UK! It’s based on an Arduino, with a shield to contain the specialist electronics for running the motors etc. This means that it uses standard Arduino tools, and I can probably learn how to hack the firmware without too much trouble. 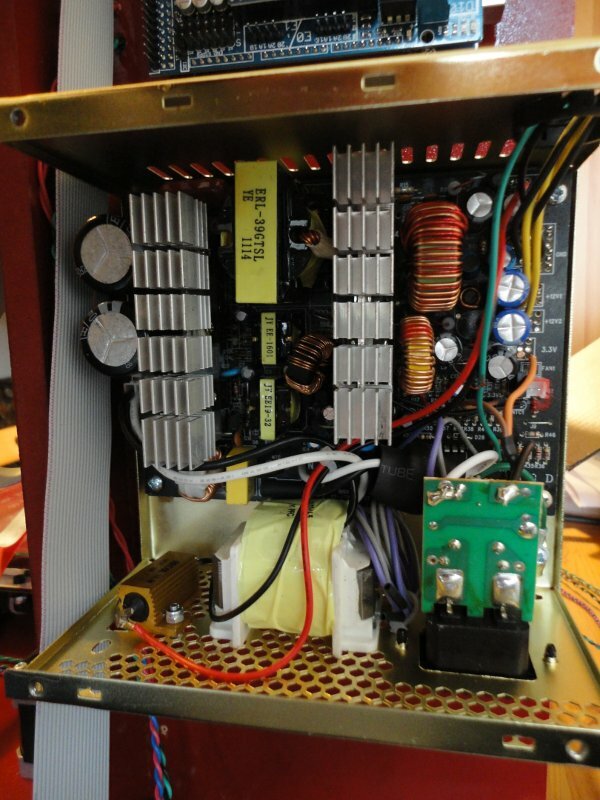 The PSU is a standard modern ATX PC PSU, modded as explained on the RepRap wiki. It turns out that PC power supplies are required, presumably for legacy reasons, to provide 3.3V, 5V, -12V and +12V power and, on some, -5V as well. Fortunately, all the wire colours are standardized. RAMPS just needs 12V. The Mendel90 design had holes for a different electronics package and also had no mounting holes for the PSU, because they aren’t standard. 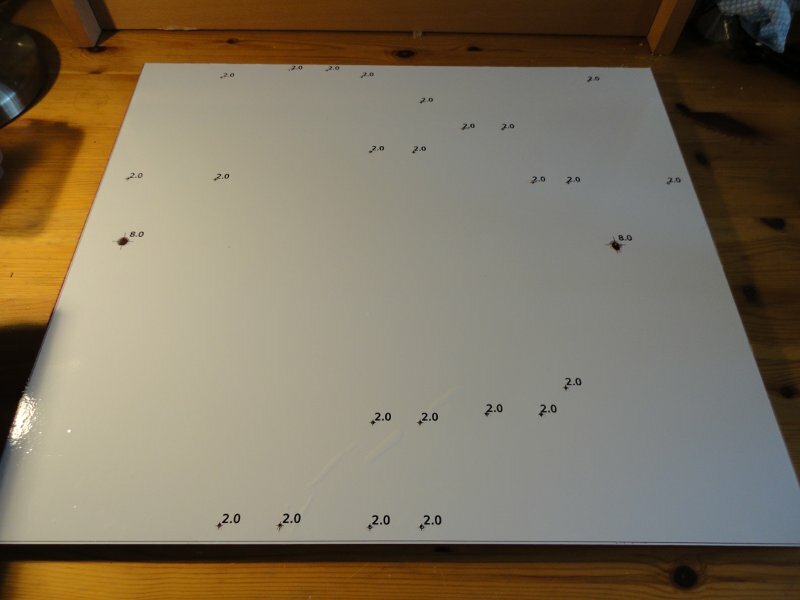 So I had to plan and drill all these holes myself. I ended up mounting the PSU below, and the electronics above – with the power input cord and on switch on the bottom side, but the power wires coming out near the electronics. I needed to leave room at one end of the electronics to add the optional SD card reader without it sticking out in a way that means it could get knocked or damaged. Once the sub-assemblies had been put together, the next stage was to start attaching all the parts to the frame. The build instructions are very helpful in explaining what to do in what order. Here is a picture part-way through the assembly, with the Z rods, motors and lead screws in place. The Mendel90 model is even detailed enough to model and provide printed parts for appropriately-sized (calculated using circle packing rules!) 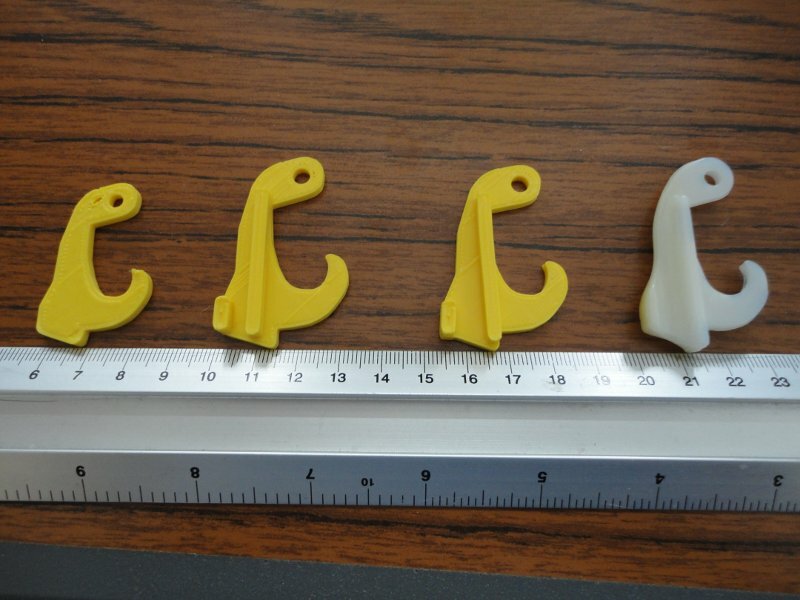 cable clips for the various cables which run along the frame. The next stage was the insertion of the X bars and then the addition of the Y carriage, along with the drive belts. You can see that the extruder platform, the central black piece, now has 3 cartesian axes of movement – it can slide along the X bars, the entire X carriage can go up and down the Z bars, and the Y carriage moves in and out. Coordinating these movements very carefully is necessary for accuracy and quality in the print. The shiny thing on top of the Y carriage is a heat shield, made from low-tech cardboard and reflective high-temperature tape. 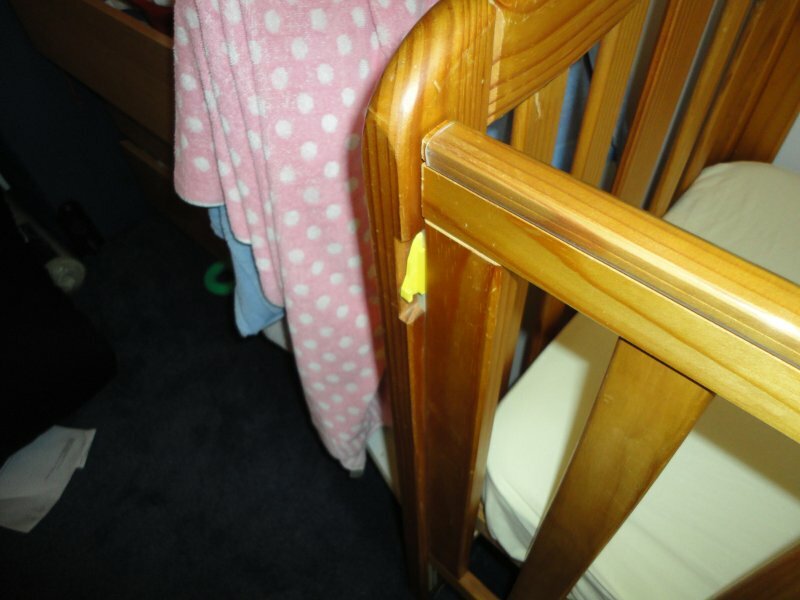 This prevents the carriage heating up and warping, and throwing the bed out of true. Now, blogging has caught up with reality – this is the condition of the project as I write :-) The next step is to modify a PC power supply to provide juice, attach it and the control electronics to the rear stays, and wire it all up. Once the frame has been assembled, the next thing was to put together some of the individual sub-assemblies. The Mendel90 design’s build process automatically generates BOMs (Bills of Materials) for each of the sub-parts. It’s also possible to render those parts alone, and in an “exploded” view, using the OpenSCAD software, and examine it from all angles. These two things together make it obvious in most cases what screws and parts go where. The build instructions add any extra tips, or hints on the order in which to do things, which may be necessary. Let’s take an example, the X idler end. This is the assembly at the opposite end of the X carriage to the motor, which contains the pulley over which the X drive belt runs. 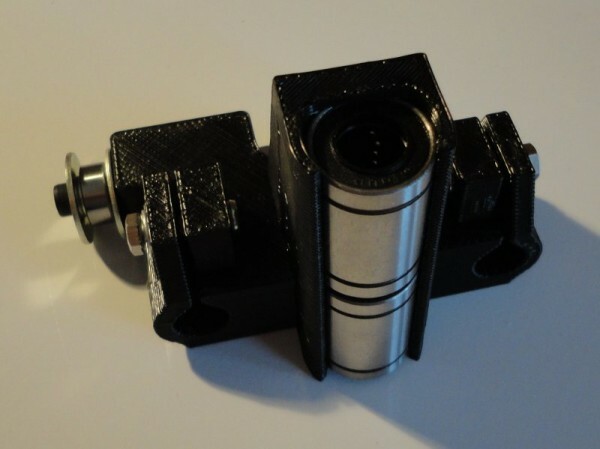 It also has bearings so the entire X carriage can move up and down the Z axis. The instructions give tips on how to clear out any excess plastic, and the best way to insert the linear bearings in the channel. (Unfortunately, my choice of black plastic means that these photos do not come out as clearly as they might.) 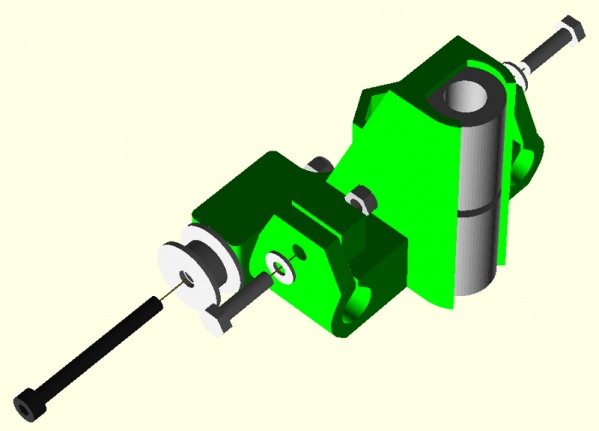 Some of the other assemblies are more complex than this one, but the principles are the same.